If you’re in need of a musically talented smart home speaker, and nothing from Apple or Google have caught your eye yet, Harman Kardon Invoke might be exactly what you’ve been waiting for. 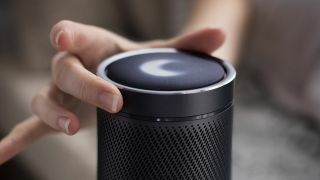 Additional details on the first Cortana speaker, which was announced back in May, have begun to leak out and include the speaker’s release date (October 22) and expected price ($199). If these leaks turn out to be accurate, that would put the speaker slightly above the newly announced Amazon Echo Plus, which is expected to come out later this month for $149 (£139, or around AU$200), but well under the cost of the new Google Home Max – Google’s hi-fi home assistant that costs $399 (about £300, AU$500), which is expected to come out in December of this year. What we know so far about the Invoke is that it promises 360-degree sound via three woofers, three tweeters and two bass radiators, and that the speaker will include Cortana, Microsoft’s virtual assistant. Like both Amazon and Google’s assistants, the Invoke will be compatible Nest, Philips Hue, SmartThings, Wink and Insteon devices. If it feels like the Invoke is coming into a crowded market – you’re not wrong, it is. It follows the announcement of the Apple HomePod, the Amazon Echo 2017, the Amazon Echo Spot, the Amazon Echo Plus, the Google Home Mini and the Google Home Max, not to mention all of the upcoming Alexa-integrated third-party products like the C by GE SOL. This creates a lot of choice (yay!) but also a lot of confusion for those looking to buy a smart speaker for the first time (boo! ).